It is our distinct pleasure to welcome back Thomas Park, aka mystified, to Earth Mantra, as well as to welcome for the first time ctephin, an experimental noise group hailing from Oklahoma in the USA. Together, these diverse artists have collaborated on one of the most intriguing releases of 2009, entitled Quetzal. Thomas has long been known for his ability to leap from genre to genre without the slightest sign of effort. Likewise, ctephin is well regarded for their vivid and profound experimental noise compositions. So we were quite intrigued by what the result would be when these two groups made music together. As we guessed, this album is quite unlike anything we've ever heard from either artist in the past. 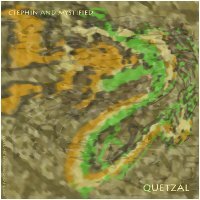 Quetzal is a mind bogglingly great collection of intense music that we can only describe as tribal ambient noise - and we use the word intense very deliberately. Indeed, the first time we listened to this album we were blown away by the energy and sheer ferocity of the music, as wave after wave of sound poured over us like the billowing plume of smoke from an open incense cauldron. The hand percussion, noise elements, and overall sound design blend magically like an ancient witch's brew, filling the senses with shamanic visions and sounds from vanished civilizations. Some of the most sensual and evocative music we have heard in a very long time. And despite the experimental nature of much of the music, it is supremely approachable for folks who don't ordinarily like their music so abstract or atonal. Truly genre-spanning work, with something in it for everyone. To the best of our knowledge, this is the first time that ctephin and mystified have released a collaboration, but we certainly hope this will not be the last. With results as powerful as these, it would be a tragedy if they don't follow this album up with additional music in the future. Highly, highly recommended. Wow.... what an amazing work. I was compelled to write a comment for this album but I can't seem to conjure anything up but "wow". Immediately up there with my favourite Earth Mantra releases, this album just covers so much ground. Special mention has to go to the second track, just an incredible dynamic throughout. Highly recommended. Perfect soundtrack for a lazy summer afternoon. An excellent piece of ethno-ambient! Mystified and Ctephin lead us smoothly in a strange but welcoming jungle of sounds, between light tribal ambient rythms, distant insect swarms, trembling halos of white heat and refreshing waterdrops from a hidden fountainhead . Perfect soundtrack for a lazy summer afternoon.